The Deathmask of El Gaucho, by Dan Mancilla. Marquette, Michigan: Little Presque Books/Passages North, 2016. $5.00, paper. I would assume that writing about professional wrestling is infinitely harder than writing professional wrestling itself. The conceit of wrestling is a simple one, one person saying to another You have caused me personal and/or professional strife and I wish to rectify that within the parameters of a wrestling match. The performances are where the magic happens, where the son of a plumber does so much more than just tell you about the difficulties and desires that go with trying to beat the handsome world champion. The writer has their own hard times. They must invent not only the narrative, but the magic. They must be the wrestler and the crowd, both ends of the battery. Dan Mancilla’s The Deathmask of El Gaucho takes place at a time when the idea of wrestling being “real” began to unravel, when, despite national highs in terms of brand value, merchandise, and general popularity, wrestling hadn’t quite decided what it wanted to be. Today, people might say “WWE” to sum up wrestling, but there used to be a southern style and a northern style and then breakdowns within those worlds: the technical grace of St. Louis, the emotional brawling of Memphis. This book lands firmly in that sea change and perhaps embodies too much of the uncertainty. It’s an off-kilter romp and an observed confessional, and while it’s set up beautifully to deliver a quest to discover the man behind the mask, what makes him what he is, what makes him want to be what he is, there are many lost opportunities and missing details. There are immediately noticeable allusions to and stand-ins for elements of the wrestling world as it already exists—the pop culture phenomenon of Hulkamania, the legendary Rotundo/Windham family, the rise of post-Wrestlemania WWF in the eighties—but I fear that too much of the book is leaning against this sort of nostalgia. It’s nice and homespun in small doses, a comfort for those of us weaned on bicep tassels and dramatic finger pointing, but it’s simply not enough. Additionally, some of the names in the “Ten Bells” chapter come off like last-minute edits to fan fiction: Briscoe Hart, Tietem Foley, Ultimate Dingo. The best part of “Emperor Jones” is that it’s wonderful on its own in addition to being an ancillary-yet-telling part of the El Gaucho story. I only wish it had appeared in the same penultimate position (or perhaps one story earlier) of a book that was written with the same focus to the arc and style. In a way, what we end up with is a view of El Gaucho that seems to aim for mystery, to tell the story of him without him. It’s a great idea—Neil Young’s biography operates successfully under a similar pretense—but all the tonal shifts make for an odd ride. 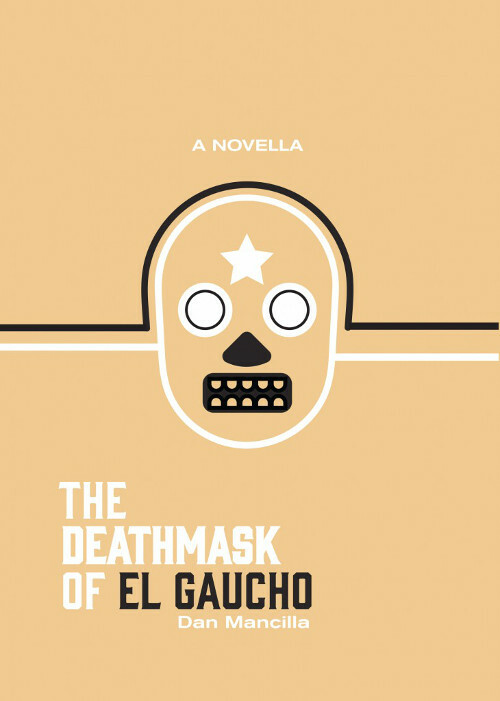 The Deathmask of El Gaucho is pitched as a novella, perhaps in stories, but I don’t know what to make of it. The first chapter is brief and overly poetic, almost an odd summary of all of wrestling. What follows is a lengthy chapter in the form of reportage, itself homage to the days of wrestling rag sheets, part rumor and part perceived-truth. Then there’s a chapter narrated by a teenage wrestling fan, followed by a chapter that’s just a chronological, annotated list of wrestlers who have died. Two short chapters, one a third-person account of El Gaucho in his post-mask days and the other a second-person summary of how he came to find success with the mask, precede the “Emperor Jones” story before the book ends with a stylized report in the “royal we” on the first public/publicized wrestler death in 1919. The tonal inconsistencies probably have more to do with the spacing between the pieces than anything else: the title story’s publication date goes back fifteen years, and four other stories showed up in journals in the last four to seven years. What we end up with is something not quite sequential, not quite steady. The overall narrative is masquerading as a mystery or riddle, a sort of “Who’s On First?” of the novella-in-stories. Wrestling tells its stories through a series of bizarre, physical altercations, some competitive for the simple sake of pride and some as an excuse to hit another man in the nuts with a bowling ball. No matter the format, it comes down to details and grace. Writing is no different, and as The Deathmask of El Gaucho proves, some matches are better than others, sometimes within the same show.